The hedgehog likes to live where there is a good supply of food often in wooded areas and farmland but they are often seen around built up areas as well. They like to use dry leaves for their nests and so often curl up in bonfires waiting to be used. Hedgehog like to come out in the evening and can often be seen snuffling around in gardens. They are the gardeners’ friend as their natural diet is slugs, caterpillars, weevils etc. They are meat eaters and so should be feed either tinned dog or cat food or specially prepared hedgehog food. Do not feed them bread and cows milk as this can cause them to become ill.
Hedgehogs need to weigh 450g to be able to survive the winter hibernation. If they are born late in the year they do not have time to gain this weight and so will not survive. 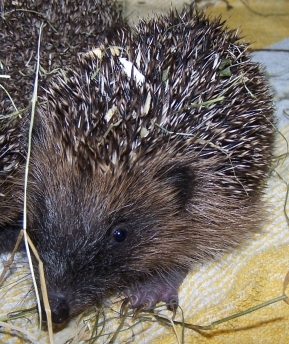 There are special centres, which are able to take on these young underweight hedgehogs giving them a chance to survive.